The Super Environmental Defenders program encourages students to use what they learn from the assembly to protect the environment in their daily lives. After each assembly, students are given a Pledge Card that outlines easy actions they can take to care for the environment. Students take the card home, fill it out and mail it back to us with a parent's or guardian's signature. The card also includes a pledge for parents and guardians to support their child in protecting the environment. 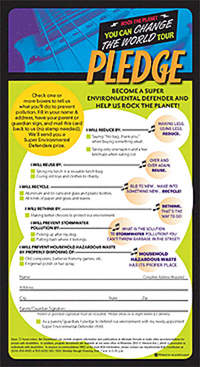 Students who return the signed Pledge Card will receive a Super Environmental Defender Membership Card in the mail. 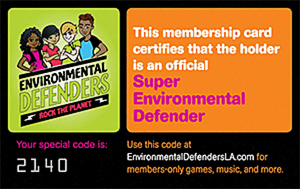 Each card features a unique code to use on EnvironmentalDefendersLA.com to access members-only games, music and more. Super Environmental Defenders can also download music from the assembly and create their own remix versions of their favorite Environmental Defenders songs.